Every doll needs booties to keep their toes warm. This pattern is a very easy one since there is no gusset and only one seam to sew up. The basic shape is like a mitten without the thumb. 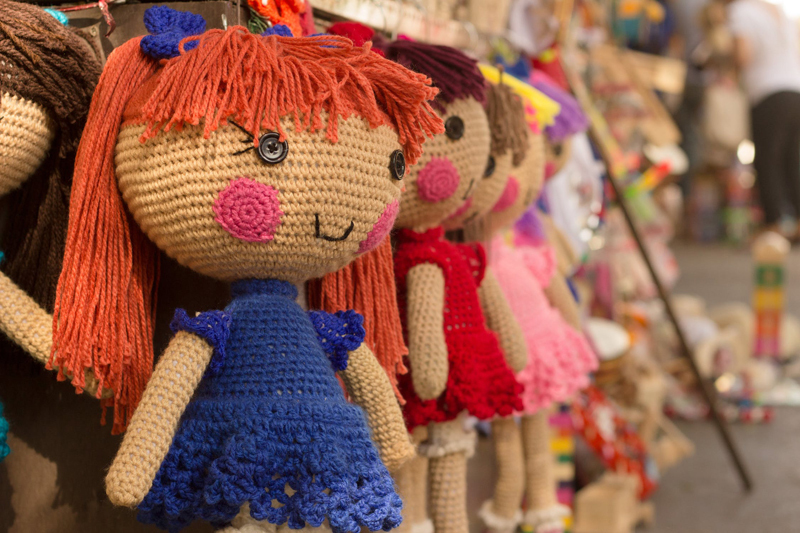 I have written it in three sizes so most dolls will be able to fit into one of them. For the booties in the picture I used Peaches and Cream cotton yarn, which is a worsted weight. I was able to get three pairs of booties from what was left of the skein after I used it to put hair on 2 dolls' heads, so you only need a little bit. Size 6 needles, one pair. This size fits on my 9 inch Destiny doll. For directions and pattern to make her look here: 9 Inch Destiny Cloth Doll. Cast on 12 stitches. Knit each row for 15 rows. Row 16 decrease by knitting 2 together across the row. Cut the yarn to about 12 inches long and thread it onto the yarn needle while the 6 stitches are still on the knitting needle. Slide the 6 stitches onto the yarn needle and draw the yarn through all the stitches. Pull it tightly to close the toe. With the rest of the yarn stitch the sides closed to the top of the bootie and weave the end of the yarn in to finish. Turn the bootie right side out and put it on your doll. Repeat these instructions to make the second bootie. Cast on 18 stitches. Knit each row for 20 rows. Follow the directions for size small for decreasing and finishing the booties. You will have 9 stitches left on the needle. 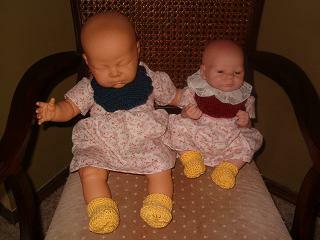 In the picture at right are my 20 inch LaBaby and my True to Life Newborn dolls wearing their new booties. This size fits both my Recycled Doll and my20 Inch LaBaby. Cast on 26 stitches. Knit each row for 25 rows. 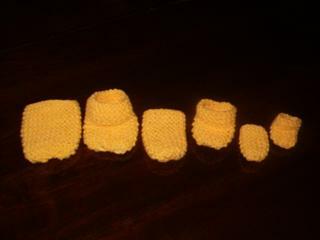 Follow the directions for size small for decreasing and finishing the booties. You will have 13 stitches left on the needle.